Defined Strategies for Better Ranking on the major Search Engines. For On Page optimization of more than 10 pages, please contact seo@submitedge.com. Note: Includes only detailed suggestion report. For implementation of recommendations, please contact support@submitedgeseo.com. The SEO optimization is mainly classified into on-page optimization and off page optimization. While the On-Page optimization deals with content and keywords on the webpage, Off-page optimization helps in creating backlinks to the website. Although both are equally important to the SEO, On-page optimization has often been considered the key to creating a more user friendly and search engines friendly website on the internet. Placing the relevant keywords in visible and invisible Meta content helps the search engine and users find necessary information faster. These simple methods can considerably expand your online presence. On page optimization has become a very integral part of the SEO process and crucial in order to improve a website's search rankings and on site traffic. on page seo services includes On-Page Optimization Strategies. 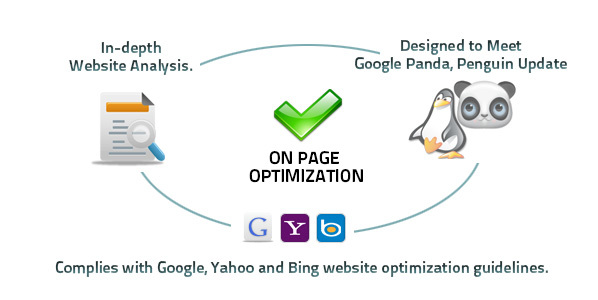 In fact our strategies are designed to Meet the Requirements of Google Panda and Penguin Updates. At the same time our services are compatible with Google, Yahoo and Bing website optimization guidelines. In the meantime we provide clear instructions on what to fix to see immediate results. Moreover we ensure that your URLs are search engine friendly and keyword rich. We analyize the indexability of the page to make the optimum changes before it is crawled. In order to provide professional look to the website we throughly examine the Factors like keyword density, repetition of words, duplicate content. We optimize Attributes like ALT tags, H1 headlines and Header tags with right keywords in order to carry more SEO weight. Our techniques will allow only the most relevant and credible anchor links and texts on your webpages. As a result website becomes more user friendly and search engine friendly. Then our SEO Expert will review your complete website. And send a detailed SEO Optimization suggestion report after the review. How important is On Page Optimization Service to a website? A. In on page seo service we optimize website helps in creating a positive and relevant image of the website to search engines. It also makes the crawling process considerably faster for search engines. A. No. The only difference caused to your search rankings would be present in their increase. In the on page seo services, We ensure that only positive and preferable changes are done to make it search engine friendly. A. Yes. We provide a detailed report underlining the steps taken and the results for upgrades on your website. A. We help you improve your website credibility by making your site search engine friendly. It will drive targeted traffic to your website. A. Yes. Creating keyword rich content is one of the main aspects of the on page optimization. We will use techniques to check the density of keywords as well as its placement in your content. A. It is not recommended that any website continue with their SEO process without On page optimization. Even if they do, it will highly undermine the efficiency of the SEO.